OneWorld Schoolhouse | All on the same page. William Dunbar School students point out the benefit of book drives: to engage both donors and recipients in literacy. Julia Goddard and Alex Boland from Gordon B. Attersley, Oshawa, ON. School children in St. Lucia and Grenada will soon have more opportunity to read thanks to 19 schools throughout Durham Region willing to help a foundation committed to improving literacy in the Caribbean. At the book drive launch at Gordon B. Attersley Public School in Oshawa on March 25, the co-founder of OneWorld Schoolhouse Foundation, Sonya White, said that literacy can help children succeed in Caribbean countries. I just think that it’s good for other people to have books because books help you learn, they help you read and I just like to help people. She told the students that in their lifetime, they’ll have on average three to four jobs that don’t even exist yet. ​“The possibilities are endless,” she said. But she said children in the Caribbean don’t have the same opportunities; they can go beyond Grade 6 and into high school only if they pass an exam, and if their parents can afford it. The job possibilities in St. Lucia are generally working at a resort on the island, or fishing. “Literacy is the No. 1 way to tackle poverty,” said Ms. White. According to the United Nations Educational, Scientific and Cultural Organization, literacy is essential for eradicating poverty, reducing child mortality, curbing population growth, achieving gender equality and ensuring sustainable development, peace and democracy. However, with limited and outdated resources initially, coupled with severe weather conditions, such as hurricanes that have been known to wipe out libraries, books are not readily available in Caribbean countries such as St. Lucia. That’s why OneWorld collects high-quality textbooks and other books from elementary and secondary schools in Ontario and redistributes them to schools in the Caribbean. Ms. White said there are more than one million school children in the Caribbean, and 500,000 underutilized and accessible books in Canada. 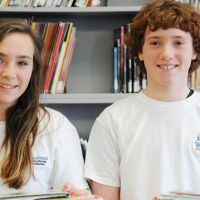 The message hit home with the students, including Grade 6 students Julia Goddard and Alex Boland, who have volunteered to help collect and pack books. I know that without books, where would we be in the world? Ms. White said book drives allow schools to cull resources in both environmentally responsible and socially responsible ways by diverting books from landfill and getting students involved. 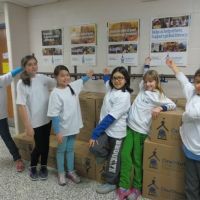 ​“This is a simple way for kids to be philanthropic and to make a difference to classmates in a different region,” she said. Ms. White said OneWorld plans to first donate books to all school districts in St. Lucia and Grenada before moving on to Montserrat. Then, OneWorld hopes to continue expanding throughout the Caribbean. Article originally appeared on March 27, 2014 on durham​re​gion​.com© 2016 Metroland Media Group Ltd.